The Sisters' Meal Festival of Miao people also called the "Eating Sisters' Rice Festival", is known as the oldest oriental ?Valentine's Day. 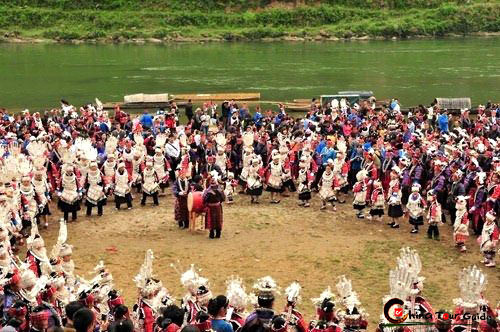 The festival held in Shidong area of Guizhou is of a strong ethnic characteristic and a grandest one. During the festival, every Miao's family should eat the sisters' rice, which is dyed and steamed five-color (red, yellow, white, blue and bland) glutinous rice, glittering and translucent, delicately fragrant and pleasing to the eye. 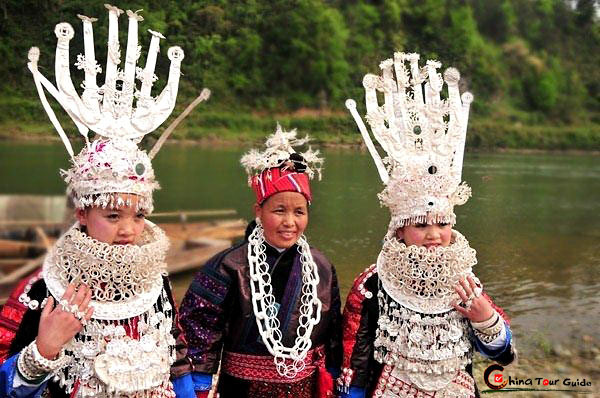 Miao girls are very partial to silver jewelry, as they see silver as a symbol of purity. The young Miao girl is dressed up nicely with the headdress, hairpins, neck-rings, chest locks, and lots of accessories. The mom is helping her daughter wearing the splendid ornaments. 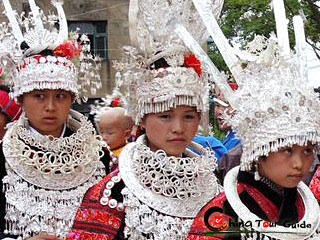 According to Miao customs, the larger, heavier, and more plentiful silver ornaments are considered the most beautiful. At the festival, young men head for other villages to ask for "sisters' rice", which is in fact a social activity for young men and young women. Young men have the freedom to decide which village to go and which girl to single out for dating. When girls send the guys the "sisters' rice", their concerns and love are hidden in the rice basket and rice bags. The girl puts different plants in different baskets or bags to show their different feelings: a bamboo hook implying a further contact; buds of Chinese toon symbolizing coming of a marriage and garlic stalk hinting a polite refusal. Of course the guys who are refused are never getting angry. 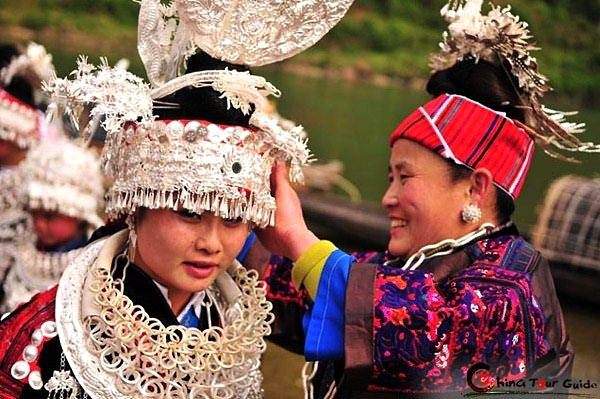 In the Miao society, even if they cannot become husband and wife, they are still good friends. Miao girls in brilliant costumes are in front of us to show their beauty. Girls at the festival are dancing in circles and singing songs of love.